A garden snail named Turbo (Ryan Reynolds) dreams of becoming the world’s fastest snail. However, his fascination and obsession with speed makes him an outsider in his slow snail community and is a constant embarrassment to his older brother Chet, who is always careful. After a freak accident one day, Turbo realizes he has been given the power of incredible speed and sets out to do the impossible: compete against the best racers IndyCar has to offer. 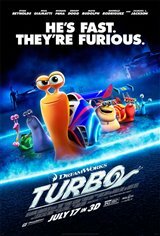 Although Turbo is an underdog, he achieves the impossible when he refuses to let his limitations stop him from reaching his dreams.